Marmas are vital spots that require varma (armour) or protection. Sushruta Samhita (Sharirasthana, VI, 41-43) states marmas should not be damaged in any way, which also means no use of acupressure nor acupuncture on them traditionally, as these cause damage and aggravate the doshas, which includes cutting, hitting, fire even near the Marma causes issues (Su. Sam. Sharirasthana, 35 & 41). The commentator on the Sushruta Samhita, Dalhana himself states the definition of Marma is "Marayanti iti marmani", which means that a Marma is one which causes death (if damaged). Marmas were hence used in battle for the purposes of maiming others and causing various injuries to organs they relate to and should be healed alone, not pushed, prodded or manipulated, which although can produce short-term effects, long-term, would aggravate the doshas and cause injuries to organs, as per the Samhitas. Originally, Marmabhyanga or Marma-Massage included therapies where Tailas or oils were used in the reduction of accumulation of doshas at the site of the Marmas; coconut-based oils and soothing pastes where Pitta and bleeding were involved, drying herbs and pastes where Kapha was involved with swelling and application of heat-boluses etc. to reduce swelling as also Tailas or oils for Vata where there was dryness and cracking at Marma sites to counter this - which also involves processes such as Shirodhara for the head-marmas (region of Pranavayu), when Vata invaded the head Marmas and so on. This is similar to how when the doshas are disturbed all over the body, one uses oil massages in order to reduce the doshas and remove them from their sites of accumulation to the GI tract for elimination. But, this was a pacifying experience and not one that places any force on the Marma, such as pressing or "stimulating" them does. ~This practise arose in later times when Sinhalese Buddhist Monks, barred from learning the true Ayurveda from Hindu Brahmin vaidyas or doctors, watched and created their own system of Marmavidya, which over time, came to represent the acupressure and acupuncture methods that spread to China and beyond and became popular in the South of India, due to the influence of Buddhist monks from Sri-Lanka learning this and taking it there. These later became popularised in Pune with the Maharashtran-Ayurveda that adopted all sorts of regimes from Kerala, including their Panchakarma and Purvakarma techniques, passing them off as part of some elaborate system, but failed to understand the history behind them! This has given rise to the whole new "marma" movement, which has been reimported back into India. Frank Ross in his book on 'Ayurvedic Acupuncture' incorrectly argues that the acupuncture arises even in Sushruta Samhita - but this is in regards to raktamoksha (blood-letting) at the sites ofmarmas, for removing pus, swelling etc., not as a therapeutic measure by itself, or acupuncture as such! 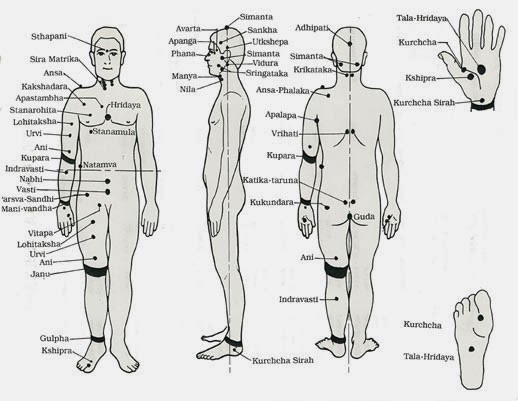 Sira vedha(puncturing or cutting of veins) is quite different from suchi karma (piercing / needling)! Yet, it finds no place in the original Ayurveda or history of Ayurveda and is itself, in fact, contradindicated!